In Google+, you don’t follow or friend people, you circle them. Everything Google+ revolves around circling people you want to follow, or applying content so that only particular circles can see that content. They help you decide whom you want to share content with. With circles, you can choose who sees your posts. You can also use circles to target who can see certain elements of your profile as well as who can see your name in search results. 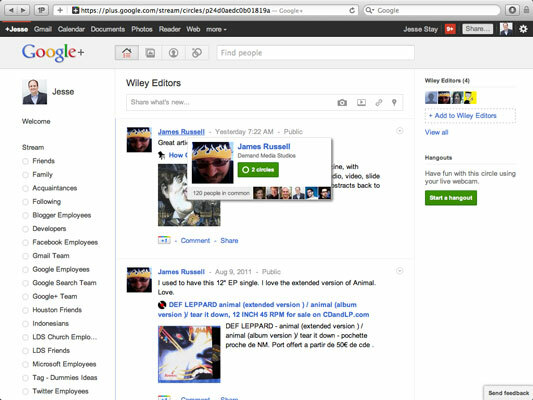 Expect this to expand even further as Google+ expands so that other websites can integrate circles. They help you decide whose content you want to see. You can view customized content from your circles just by clicking the circle name on the left column. Where are all the people you’re circling? You may have joined Google+ and circled a bunch of people, but notice that you’re still not seeing updates in your stream. Probably, this is because those people haven’t circled you yet, and they post their updates to only specific circles. Unless the people you are circling post to their Public circle, you will not see any of their content unless they add you to one of the circles they’re posting content to. Now that you know what circles are, why not create some?! 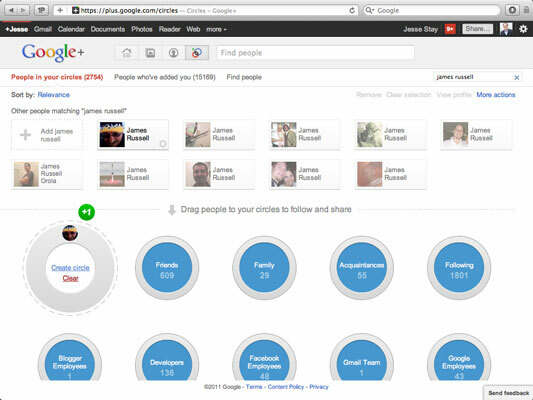 You can create circles on Google+ in a few different ways. To start, go to your Circles page by clicking the little Circles button at the top of Google+. Drag any individual or individuals you see to the Drop Here to Create a New Circle circle. Those people are added to that circle. In the pop-up box that appears, name your new circle. Click Create Circle with x People. Your new circle now appears with all the other circles! When you mouse over that circle, notice that the text changes to Create Circle. If you click Create Circle, a dialog box appears. Follow the instructions in the dialog box to create your new circle. Then drag people into it. Mouse over the name of the individual you want to create a circle for. A new pop-up box appears. If the circle you want to add the person to already exists, just click the check box next to that circle instead. Name your circle and click Create. That person is added to the new circle, and you can add other people to that circle.